Featuring Smart DSP Controlled Supply! Our newest amp design! Featuring a smart DSP (digital) controlled power supply for massive output with any speaker load and at any volume! This system makes constant on-the-fly adjustments to ensure peak performance at all times, instantly reacting to ensure full power output no matter what. Designed to be plug-n-play with your Harley-Davidson, so installation is a snap! Comes with everything needed for install. Rated up to 2-ohms stable, this is a serious piece of audio technology. 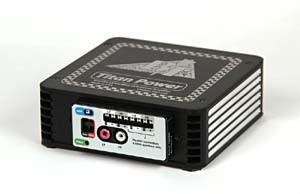 Pushes 180 watts per channel (at 4-ohms), this amplifier will be audible under all driving conditions. Fan cooling with automatic gain rollback prevents thermal shutdown. Now has a second set of speaker connections to add another set of 4 ohm speakers in parallel, such as lower speakers. And as always, it comes with an OEM Lifetime Warranty, because it's the right thing to do. Fits: 2006 to present. May have to relocate any add-on HD modules. Aftermarket Radio: 1996 to present. RoadGlide: With stock or aftermarket radio.